On May 26, 1956, the Cincinnati Redlegs and Milwaukee Braves faced off in the second game of a three-game series in Milwaukee. The result was one of the most unusual and memorable games in the history of each franchise. On the mound for the Redlegs was Johnny Klippstein, a hard-throwing right-hander in his seventh season in the major leagues with an undistinguished career record at the time of 43-63. After a 1-2-3 first inning, Klippstein found himself in trouble in the second. He loaded the bases by hitting Hank Aaron and walking Bobby Thomson and Bill Bruton. Aaron scored on Frank Torre’s fly ball to left field, but Klippstein avoided more trouble by striking out the next two batters. After six innings, the Redlegs were losing 1-0, but Klippstein was working on a no-hitter. His counterpart for the Braves, 24-year-old Ray Crone, in his third season and sporting a career record of 13-10, was pitching a three-hitter. Klippstein walked three more in the seventh, but was again able to work out of the jam. In the eighth inning with the Redlegs’ Smoky Burgess on second base and one out, Klippstein was due to bat, and the unthinkable happened: Shunning tradition and sentimentality, Redlegs manager Birdie Tebbetts pinch-hit for Klippstein despite his no-hitter through seven innings. Klippstein was relieved by Hersh Freeman, and Joe Black, who each pitched a hitless frame, thus completing an unprecedented three-man no-hitter through nine innings. The Redlegs tied the game in the top of the ninth inning. The Braves finally got a hit in the tenth, and won the game with two more hits and a run in the bottom of the 11th. Though the Braves were held hitless for nine innings, Major League Baseball removed the game from the official list of no-hitters in 1991 when it decided that a game in which a team didn’t get a hit until extra innings would no longer be considered a no-hitter. Still, the game was still a thrilling one. Klippstein’s performance (seven no-hit innings with seven walks, a hit batsman, and four strikeouts) could be seen as a microcosm for his entire career: great potential, with flashes of dominance tempered by poor control, which resulted in his fine performances often being overlooked. John Calvin Klippstein was born in Washington, D.C., on October 17, 1927, to August and Mamie Klippstein. August was born in Stettin, Germany, in 1883 and immigrated to the United States with his parents in 1894, settling in Wisconsin. He joined the US Army and while stationed in Washington he met Mamie Groves from Virginia. They married in 1913 and had three children, Katherine, George, and John, the youngest. Now a professional, Klippstein was no longer eligible to play high-school baseball. When the school year ended in the spring of 1944, Klippstein, just 16 years old, reported to Allentown of the Class B Interstate League. Against players averaging about 22 years old, he pitched in six games, and won his first game, but with a lofty 10.50 earned-run average, he was sent to Lima of the Class D Ohio State League. He went 3-2 with a 4.75 ERA. After graduating from high school in 1945, he pitched briefly for Allentown and then for Winston-Salem in the Class C Carolina League, where he finally exhibited the promise the Cardinals’ organization had envisioned. In 23 games, including 15 starts, he posted an 8-7 record and a 2.48 ERA, which ranked second in the league. Klippstein was drafted into the Army in 1946 and missed the entire baseball season. When he returned to the mound in 1947 with the Omaha Cardinals of the Class A Western League, he complained of arm troubles and struggled to regain his form, posting an unseemly 5.37 ERA.4 He was demoted to Lynchburg in the Class B Piedmont League where he didn’t fare much better, then finished the season with two brief relief appearances in Triple-A with Columbus of the American Association. He was wild; for his three teams in 1947 he walked 90 batters in 127 innings. Save for one relief outing with Columbus, Klippstein pitched the entire 1948 season with Lynchburg. Used as a starter and reliever, he was plagued by wildness, walking 119 in 155 innings– while still complaining of arm and shoulder pains. Just 20 years old, Klippstein was still considered a top prospect, and the Cardinals lost him to the Brooklyn Dodgers in the November 1948 draft; that proved to be Klippstein’s big break. Klippstein stuck with the Cubs and his major-league debut, on May 3 was inauspicious. He lost in a start against the Phillies, lasting just four innings and surrendering nine hits and four runs. Used as a starter and reliever during the season, Klippstein had trouble finding his rhythm. His first major-league win came on July 19, a complete game against the Boston Braves in which he gave up 11 hits but only three runs. He followed that up with two consecutive complete-game losses, underscoring his potential as a starter. He finished his rookie campaign with an unsightly 2-9 record, and a 5.25 ERA. Klippstein pitched for the Cubs through the 1954 season but he never established himself as the effective starter the team expected him to be. By the middle of 1951, Klippstein’s second season, the buzz around him began to fade and he was considered a “borderline hope” and not an imminent star.9 A masterful performance like his six-hit shutout of Pittsburgh in his first start of the 1951 season was countered by several poor outings with “flights of wildness” eroding Frisch’s confidence in him. He finished 1951 with six wins and six losses. In 1952, Phil Cavarretta, who replaced Frisch at midseason in 1951, slotted Klippstein for the bullpen. He fought his way back into the starting rotation after shifting out the Dodgers in early May and then completed three of his next four starts. “Johnny has a world of stuff,” said pitching coach Charlie Root. “Johnny was pitching out in the open, far away from his body. The batter could follow the ball too easily. We got him to change his windup so now he brings the ball down just below his belt and then pivots before delivery.”10 Klippstein had a losing record (9 wins and 14 losses) while compiling a 4.44 ERA. Fighting wildness, he hit six batters and uncorked a league-leading 12 wild pitches. Described as a “gangling loose-jointed fellow with an unruly mop of curly black hair outlining a baby face,” Klippstein married Mary Ann Artac in 1952.11 She was a niece of Cubs pitcher Dutch Leonard, whom Klippstein considered one of his biggest influences in his early career. The Klippsteins lived in Chicago, where Mary Ann was a nurse. They had two daughters, Mary Jo, and Barbara, and a son, John Jr. In the offseason Klippstein had a series of jobs, among them working for sporting-goods stores and selling insurance. Klippstein’s nickname, “The Wild Man of Borneo” (the title of a 1941 film), was reinforced by his erratic campaign in 1953. He reached double-digit victories for the first time (10) but lost 11, and walked 107 batters. By 1954 the Cubs disclosed that they had been actively shopping him since the previous spring. In ’54 Stan Hack, Klippstein’s third manager in five years, gave him another opportunity to prove himself as a starter, but Klippstein struggled all year and at one point lost eight consecutive decisions on his way to a miserable 4-11 season. His ERA ballooned to 5.29 and he walked almost six batters per nine innings. After the season Klippstein was traded to Cincinnati in a five-player deal. Manager Birdie Tebbetts tabbed him for middle relief, to which Klippstein responded, “Either starting or relief pitcher is all right with me, but not both. That’s the way it was in Chicago.”12 An impressive seven-inning start in early May moved Tebbetts, who was seduced by Klippstein’s hard throwing. Despite not being used consistently as a starter, Klippstein pitched better as the season progressed. He always possessed a strong overhand fastball, but his slider and curveball were inconsistent. Klippstein credited Reds pitching coach Tom Ferrick with helping him develop a slider thrown at three-quarters. “That way the ball breaks in the same plane instead of down and away,” Klippstein said. “It’s mistaken for a fastball when coming plateward.”13 He finished 1955 with a 9-10 record and a 3.39 ERA, but pitched one of his two career one-hitters, beating the Dodgers 9-0 in early September, his fourth victory of the year against Brooklyn. Klippstein began 1956 with an impressive 10?-inning complete-game loss to the Cubs, and completed seven of his first 12 starts, including his seven innings of no-hit ball and another tough 10?-inning complete-game loss. He finished the season with career highs in several categories, including wins (12), innings pitched (211), starts (29), and complete games (11). Klippstein’s inconsistencies confounded manager Tebbetts, who thought he experimented with too many different pitches and had problems pacing himself as a starter. “I don’t know what’s holding back Johnny Klippstein,” Tebbetts said. “He throws harder ... than almost anybody we’ve got. Johnny has everything a pitcher needs to win.”14 Given the Opening Day start in 1957, Klippstein expected great success, but the season devolved into a complete disappointment as he was hit hard almost all season and shuttled unceremoniously between relief and occasional starts. If anything, Klippstein was exasperating. After not starting for almost two months, he pitched two consecutive complete-game victories, including a ten-inning gem, to close out the season, but still finished with an atrocious 5.05 ERA and just eight wins (11 defeats). The turning point in Klippstein’s career came in 1958. Lost in the Redlegs’ bullpen, he was traded hours before the deadline to the Los Angeles Dodgers, along with first baseman Steve Bilko and pitchers Art Fowler and Charlie Rabe for pitcher Don Newcombe. “Johnny Klippstein’s got good stuff,” Dodgers manager Walter Alston said. “I am planning to use him as a middle man in relief.”15 Pitching exclusively out of the bullpen for the first time in his life, Klippstein seemed more relaxed, had better command of his pitches, and was arguably the Dodgers’ most effective reliever. Over the next nine seasons, Klippstein breathed new life into his career by establishing himself as an effective relief specialist. “By pitching more often in relief,” Klippstein said, “it sharpened my control and gave me more confidence.” In 1959, he was on pace to pitch in more than 50 games, but he developed back problems in mid-June and was ineffective the rest of the season.16 The Dodgers won the NL pennant on the strength of their pitching and Alston decided to carry Klippstein on the World Series roster despite his having had just two appearances in the last two months. Johnny saw mop-up duty in the White Sox’ 11-0 victory in Game One, pitching two scoreless innings, his only appearance in the Dodgers’ World Series victory. Klippstein’s age, health, and poor outings during spring training in 1960 concerned the Dodgers, and they sold him to the Cleveland Indians in April 1960 for a reported $25,000. Indians general manager Frank Lane was undeterred by Klippstein’s back problems, and desperately wanted an experienced relief pitcher to shore up his very young starting rotation. Pitching in the American League for the first time, Klippstein assured the Indians that he felt fine. “The doctors told me to rest all winter,” he said. “They told me I couldn’t make my back any worse by pitching.”17 This information seemed to remove a psychological barrier, and Klippstein pitched well enough to be awarded the closer’s role for the first time in his career. He pitched extremely well all season, led the league with 14 saves, posted his first sub-3.00 ERA, and was one of the most effective closers in baseball. 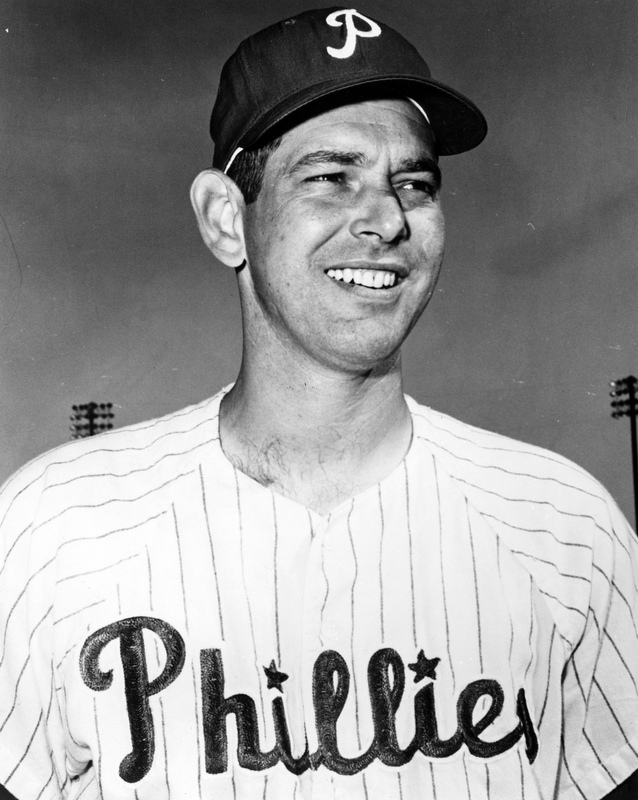 The Phillies were poised for even more success in 1964 but Klippstein’s prospects soured. When the team acquired reliever Ed Roebuck from the Senators on April 21, to set up closer Jack Baldschun, Klippstein was marginalized. He lost favor with manager Gene Mauch, and pitched just 11 times totaling 22? innings in the Phillies’ first 61 games. When injured starter Cal McLish, a personal friend of Mauch’s, returned to the club in late June, Klippstein was waived. At the time, the Phillies were in first place with a 38-23 record. Klippstein was claimed by the Minnesota Twins, and impressed Twins manager Sam Mele by pitching in 33 games in three months and posting a 1.97 ERA. Neither Baldschun nor Roebuck pitched as well for the Phillies as Klippstein did for the Twins. One can only wonder if Klippstein would have helped the Phillies avoid their epic collapse. In 1965 Johnny Sain was named pitching coach for the Twins and began to work his wonders on Klippstein by teaching him a quick-pitch curve. “It’s sort of a slider that drops,” Klippstein said. “It is thrown with the motion of a curve, but you throw it fast.”22 With closer Al Worthington, Klippstein was the most effective relief duo in the American League, the Twins won the pennant. In early July, Klippstein threw 8? consecutive hitless innings over three appearances. “If I am loose and throwing,” The 37-year-old Klippstein said of his ability to pitch so often, “I can get ready to pitch in ten pitches in the bullpen and eight more on the mound.”23 He finished the season with a sparkling 2.24 ERA in 56 appearances. In the World Series, he pitched a scoreless inning in Game Three when Claude Osteen shut out the Twins, and pitched another 1? scoreless innings in Game Seven when Sandy Koufax tossed his three-hit gem to clinch the title for Los Angeles. Klippstein capped off a stretch of 23 consecutive appearances dating from August 1 in which he did not give up a single run. Klippstein lost some of his effectiveness in 1966, and pitched in just 26 games. “I believe that [manager] Sam Mele has lost confidence in me,” he lamented after the season. “I didn’t pitch much and that bothered me.”24 When he was released after the season, it was the first time in 23 years that he was out of work. Klippstein wanted one last chance to pitch. The Detroit Tigers invited him to work out during spring training in 1967. He pitched well enough to earn a contract, but was released in late May after just five appearances. An easy-going man, Klippstein retired after playing 18 years for eight major-league teams. He finished with a 101-118 career record and a 4.24 ERA. He had a wry sense of humor about his career. “For years, people used to ask me, ‘When did you have your best season?’ And I always answered, ‘I’ve never had what I call a good one.’ ”25 Asked what he could have done differently to enjoy the success so many predicted for him, Klippstein responded, “I don’t know the answers. I think I fooled around with too many offbeat pitches, the knuckle scrooge and slider when I should have known the fastball was my bread and butter.”26 With his effective fastball with natural movement, and ability to warm up quickly, Klippstein might have been perfectly suited to be a closer in today’s game. An updated version of this biography appeared in "A Pennant for the Twin Cities: The 1965 Minnesota Twins" (SABR, 2015), edited by Gregory H. Wolf. It originally appeared in "The Year of the Blue Snow: The 1964 Philadelphia Phillies" (SABR, 2013), edited by Mel Marmer and Bill Nowlin. 1 The author would like to express his gratitude to Ray Crone, who was interviewed on April 23, 2012. 2 The Sporting News, March 22, 1950, 13. 5 The Sporting News, November 30, 1949, 7. 6 The Sporting News, December 7, 1949, 26. 7 The Sporting News, March 22, 1950, 17. 9 The Sporting News, June 13, 1951, 8. 10 The Sporting News, May 21, 1952, 4. 11 The Sporting News, February 23, 1955, 25. 13 The Sporting News, September 21, 1955, 19. 14 The Sporting News, February 20, 1957, 21. 15 The Sporting News, June 25, 1958, 11. 16 The Sporting News, August 5, 1959, 9. 17 The Sporting News, May 25, 1960, 8. 18 The Sporting News, February 15, 1961, 10. 19 The Sporting News, August 18, 1962, 9. 20 The Sporting News, May 25, 1960, 8. 22 The Sporting News, March 20, 1965, 21. 23 The Sporting News, June 24, 1965, 7. 24 The Sporting News, November 5, 1966, 31. 25 The Sporting News, April 23, 1966, 35. 26 Sandy Grady, “Modern Marco Polo. Johnny Klippstein's a man on the go,” Baseball Digest, September, 1964, 56.